This fall Emmett and Adalyn are taking a dance class. Tenley is their teacher and she is awesome! Emmett's class is first and is 45 minutes long and I drop him off for that. Adalyn's class starts 15 minutes after his is over and it is a "dance with me" class so I get to go with her. Adalyn loves to dance, just like her brothers, but the first class she didn't dance a lot. She usually does whatever she wants when she dances and in this class you follow the teacher and the music. She seemed to be happy but I wasn't sure if she was old enough and interested enough to catch on. Sure enough, a few classes later and she is following all the movements the teacher is doing! She really was doing great and I know she loves it. In fact this morning Emmett was picked up by someone else and taken to dance class. Adalyn heard me talking to him about going with someone else to dance. Then when Adalyn and I got into the van and drove to the store while we waited for Adalyn's class to start, she promptly shouted "No! Dance!" when we arrived. Even though I hadn't talked about it for at least a half hour, and never mentioned it to her, she knew she was going to get to go to dance that day and wasn't about to miss it. She calmed down when I told her we were going to dance class next. Nothing gets past this little girl. 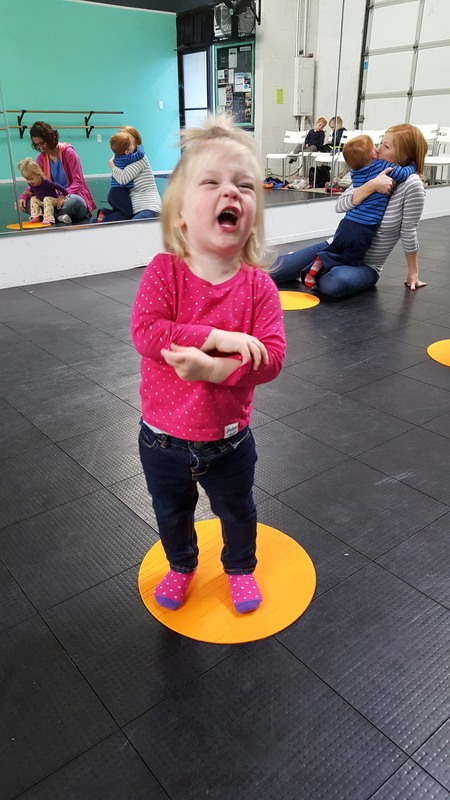 Can you tell if she likes dance class by this picture?